1.The Rt. Hon’ble Mr. K.P. Sharma Oli, Prime Minister of Nepal, is on a State visit to India from April 6-8, 2018, at the invitation of the Prime Minister of India, Shri Narendra Modi. On April 7, 2018, the two Prime Ministers comprehensively reviewed the entire spectrum of multifaceted ties between the two countries. They welcomed the growing partnership between the two governments, private sector and at the people’s level. The two Prime Ministers resolved to work together to take bilateral relations to newer heights on the basis of equality, mutual trust, respect and benefit. Recalling that the close and friendly India-Nepal relations are built on the strong foundation of shared historical and cultural links and close people to people contacts, the two Prime Ministers underscored the importance of regular high-level political exchanges in cementing bilateral ties. Prime Minister Oli stated that his government attaches high importance to further strengthening friendly relations with India. He expressed the desire of the Government of Nepal to develop bilateral relations in a way so as to benefit from India’s progress and prosperity for economic transformation and development. Prime Minister Modi assured Prime Minister Oli that India remains committed to strengthening its partnership with Nepal as per the priorities of the Government of Nepal. Prime Minister Modi stated that Government of India’s vision of ‘Sabka Saath Sabka Vikas’ is a guiding framework for India’s engagement with its neighbours for a shared vision of inclusive development and prosperity. Prime Minister Oli stated that after the landmark political transformation, his Government has given priority to economic transformation with the motto ‘Samriddha Nepal Sukhi Nepali’. Prime Minister Modi congratulated the people and the Government of Nepal for successful conduct of local level, federal parliament and first-ever provincial elections in Nepal and appreciated their vision for stability, and development. The two Prime Ministers inaugurated the Integrated Check Post at Birgunj in Nepal. They hoped that its early operationalization will enhance cross-border trade and transit of goods and movement of people bringing greater opportunities for shared growth and development. The two Prime Ministers witnessed the ground breaking ceremony of the Motihari-Amlekhgunj cross-border petroleum products pipeline at Motihari, India. The two Prime Ministers underlined the need for expeditious implementation of bilateral projects in Nepal, and to reinvigorate the existing bilateral mechanisms to promote cooperative agenda across diverse spheres. The two Prime Ministers agreed that the visit has imparted new dynamism to the multifaceted partnership between the two countries. Prime Minister Oli thanked Prime Minister Modi for the invitation and warm hospitality extended to him and his delegation. 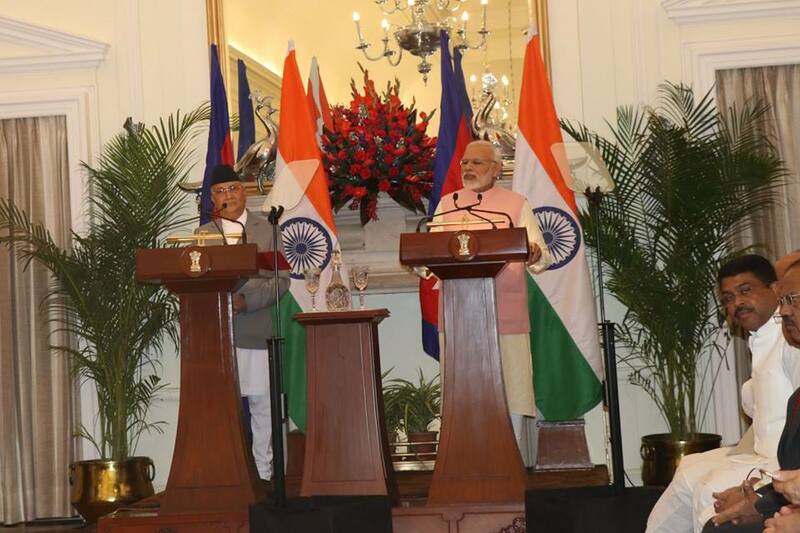 Prime Minister Oli extended an invitation to Prime Minister Modi to pay an early visit to Nepal. Prime Minister Modi accepted the invitation; dates would be finalized through diplomatic channels.